Dead Space 3 came out today and that means it's time to announce some Dead Space 3 DLC! Mildly psychotic systems engineers who just can't get enough of the chopping and the stomping will be happy to hear that the "brutal" Dead Space 3: Awakened, the first DLC expansion for EA's new third-person shooter, will be out in March. The new material will drop players into the "darkest chapters" of the Dead Space series, with Necromorph-killing action that's "more gruesome and terrifying than ever before." "In Dead Space 3 Awakened, gamers will experience some of the most disturbing content they have ever seen in a Dead Space game," Dead Space 3 Executive Producer Steve Papoutsis said. "They are going to love it." And what's it all about? About ten bucks! Ha! No, but seriously, Dead Space 3: Awakened will list for $9.99 on the PlayStation 3 and PC, or 800 Microsoft points on the Xbox 360. 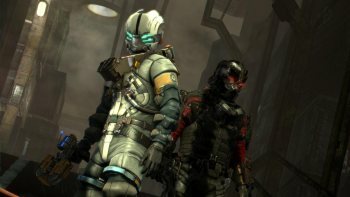 As for where the DLC will take you or what you'll do in the guise of intrepid hero Isaac Clark, I have no idea, nor do I have any idea why EA seems to think that the best way to handle gamer upset over the presence of microtransactional DLC in Dead Space 3 is to throw more DLC at them on launch day. It's not as though you have to buy it, but appearance is everything and I can't help thinking that this comes off as just a wee bit tone-deaf.